Home » Top 10: Luxury Watches » A. Lange & Sohne Tourbograph "Pour le Mérite"
Quickly gaining a reputation as one of the world’s preeminent watch manufacturers, even on par with Patek Philippe, is A. Lange & Sohne. 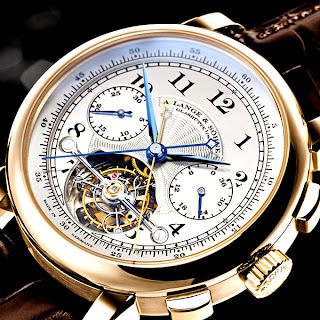 The limited Tourbograph features an incredible A. Lange tourbillon coupled with a split-second chronograph capable of measuring one-sixteenth of a second. Like the Breguet above, it uses a fusee and chain transmission, and in 2006, the Tourbograph won the Special Jury Prize at the Watchmaking Grand Prix.